Why don’t we switch to Dvorak? I was following a @monkchips link to IgnoreTheCode about smartphone touch keyboard design, and thought about a bigger issue. Sure, it’s embedded in tons of hardware – both plastic/metal and muscle for many of us – but isn’t it a good time to switch? The immensely fast pace of learning for younger people, plus the soon-to-be outpouring of new keyboard and input styles seems like we could actually start the switch now. Not only would touch-screen keyboards be simple to switch, but form factors and tactile feedback are changing for more and more of our data entry. This would be a good time for existing QWERTY folks to start switching their muscles to think AOEUI instead, since we’re already having to adjust to how glass-screen typing feels anyway. Hmmm, that’d be a great geeky replacement for ROT13 too. Please add a clear and obviously explained option, for both callers and AT&T customers, to permanently disable the carrier-provided messages for voice mail. A suggestion for your business model: realize that in today’s age of excessively fast information, your customers actually do care about the details – and if they don’t now, some blogger will remind them of it soon. And yes, several attendees (cell executives) admitted to me, point-blank, that the voicemail instructions exist primarily to make you use up airtime, thereby maximizing ARPU. will alienate your company from larger and larger segments of your customers in the coming years. And it’s not just the cost issue, it’s the efficiency issue. Your fellow industry leaders have admitted that they’re PURPOSEFULLY wasting our time. While I can understand that your purpose is to make a profit, it’s just insulting to be doing it by explicitly being inefficient. Copyright (C) 2009 Shane Curcuru, All Rights Reserved, All Ideas Interesting. So the time has come in my life to invest in a home office chair. I’ve done all the rounds of Inexpensive Office Supply House chairs, and even special order ergonomic chairs you can request at $dayjob if you figure out the right forms to fill out. And still, I have persistent back problems. So it’s time to invest. Before I blow several hundred USD on an Aeron, does anyone have specific suggestions for fully-adjustable, comfortable, traditional-ish office chairs? No, I don’t like the knee chairs. Yes, I might someday consider a ball chair with a back. And yes, I probably need something that rolls; that has seat level and angle adjustments; has back up, down, angle, and lumbar depth and height adjustments. None of the normal chairs I’ve tried ever end up being at the right place of my back. And now for the Friblogging. You were wondering what that… well, maybe not. Yes, it’s true: I drove under the Longfellow today – twice! – and lived to tell the tale. Even more amazing: there were simultaneously 2 red line trains atop the Longfellow at the same time. I seriously considered waiting, but there’s no place on the little Memorial/Land Blvd turnaround loop to pull over, so I took my chances. What’s with the recent invasion of little white “TownName SINGLES!” signs everywhere? I swear they’re worse than mushrooms after a heavy rain, or kudzu. Do my fellow readers to T/bike/walk ever see them? If you drive local roads in or near Cambridge, you can’t miss’em. I think one day I saw someone just walking by removing them just out of spite (or because they were DPW workers cleaning them up). A project I’ve worked on is now suddenly – at the last moment – held up because of a missing approval. Sigh. Paperwork will get you every time, immaterial of actual work done. I think it’s time for everyone to simply have an unlimited mail store, so we can all save everything, just in case you need the records someday. (Yes, I realize that’s actually a huge issue for modern business). 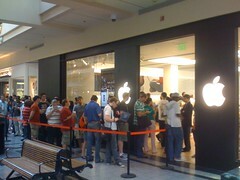 Yes, Virginia, people have waited in line for ONE WHOLE WEEK just to be able to touch an iPhone. OK, just kidding, I keep going around lunchtime, so I’m sure it’s people who were only waiting an hour or so. I hope. I was interesting, nonchalantly walking into the Apple store, right past the 3 mall security guards they had guarding the doorway. I actually needed to buy something that wasn’t an iPhone. There was still a line to pay, but not as long. Phew. Luckily, I had brought some food just in case I got trapped. With the coming of the second iPhone, many eyes in locked-in cell phone contracts turned hopefully, or desperately, toward the freedom of the free data plan. 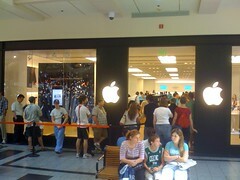 The Apple store became the great activation point. But, not everybody could get to the Apple store directly, and so a tortuous, roundabout activation trail sprang up – from the Starbucks to the Crate & Barrel… across the food court past the A&E… then by skateboard, or rollerblades, or foot across the red rope of the line, to the Apple store in your neighborhood. Here, the fortunate ones through money, or influence, or luck, might obtain iPhones and activate them online; and from activation, to the land of fast web browsing. But the others wait in line… and wait… and wait… and wait. And now for the local news. A local man, reported missing by his loved ones, was discovered today at the Cambridgeside Galleria. Reportedly he had been waiting in line to have his iPhone activated, and was unable to phone home to report his whereabouts. In related news, coffee sales on Boylston St and at the Galleria are up 55% this weekend. Giant, ravenous, carrot-eating, whitetailed rabbits have been spotted leaping over Arlington Heights this weekend. Suburban gardeners not used to natural predators are warned to keep a close eye on their gardens as these wascals invade new neighborhoods. In related news, a new study on the Socioeconomic implications of food in animated American television is reported today. 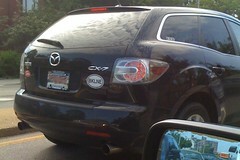 While up-and-coming Brookline may have it’s fair share of hybrid drivers, it now has enough bumper stickers going around to get easily spotted when waiting in Cambridge traffic. In related news, Cambridge scooped the region with the largest Bastille Day celebration. How long did you wait for an iPhone? But I did take a couple of pics at the Galleria, and was highly amused to see the disparity of line between the Apple store – admittedly a much cooler place to buy – and the AT&T storefront in the mall. And this was at 10AM, mind you! I will be getting one at some point, but I don’t need to stand in line on opening day. Anyway, the only cool place to stand in line would have been the flagship Boston Boylston store – I wonder how many liveblogs were sent from there overnight? Not nearly enough from my googling so far. I can’t decide who’s more the true apple geek: those who went for the camaraderie of waiting in front of the giant glowing apples, or those like Jenny who simply plotted out where the nearest under-crowded AT&T store (or other carrier, if you don’t live in the US) was on their way to work.